Located in Guadalajara (Downtown Guadalajara), Hotel Morales Historical & Colonial Downtown Core is within a 10-minute walk of Plaza de Armas and Metropolitan Cathedral. 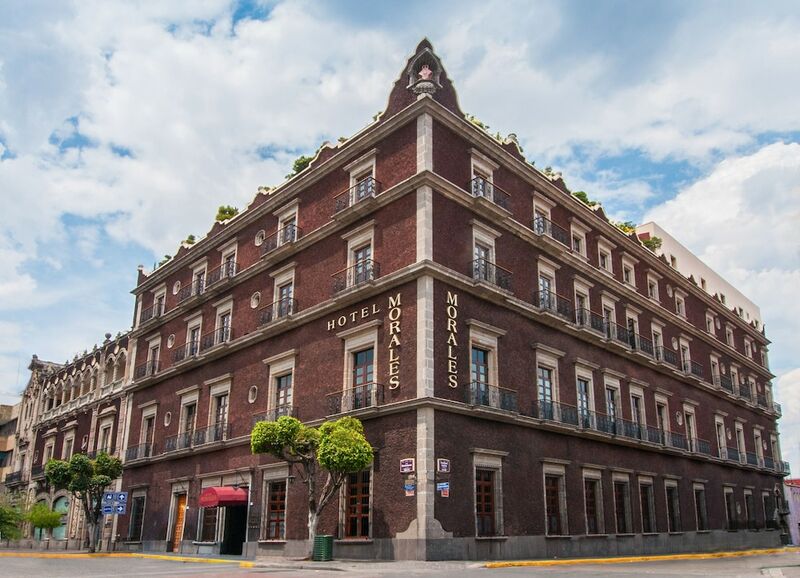 This historic hotel is 4.1 mi (6.6 km) from Expo Guadalajara and 5.3 mi (8.5 km) from Plaza del Sol. Make yourself at home in one of the 64 air-conditioned rooms featuring flat-screen televisions. Complimentary wired and wireless Internet access keeps you connected, and cable programming provides entertainment. Private bathrooms with showers feature complimentary toiletries and hair dryers. Conveniences include safes and desks, and housekeeping is provided daily. Be sure to enjoy recreational amenities including a health club and an outdoor pool. This hotel also features complimentary wireless Internet access, concierge services, and babysitting/childcare (surcharge). Grab a bite to eat at EL RUEDO, a restaurant which features a bar, or stay in and take advantage of the room service (during limited hours). Need to unwind? Take a break with a tasty beverage at one of the 4 bars/lounges. Buffet breakfasts are available daily from 7 AM to noon for a fee. Featured amenities include complimentary wired Internet access, a 24-hour business center, and complimentary newspapers in the lobby. A shuttle from the airport to the hotel is provided for a surcharge (available 24 hours), and free valet parking is available onsite. Guadalajara's Hotel Morales offers complimentary wireless and wired Internet access, and a restaurant and 4 bars. Meeting spaces are available for large and small groups, and currency exchange is available. The front desk is open 24 hours a day. The hotel offers an outdoor pool, health club, and onsite spa services. Airport pickup service is available 24 hours a day (surcharge, on request) and secure parking is complimentary. Hotel Morales Historical & Colonial Downtown Core is a smoke-free property. El Ruedo Restaurant (The Bullring) - Open early morning to late night. Serving Mexican and International food. El Encierro Bar (The Bullchase) - Open Monday through Saturday, afternoon to late evening. Serving snacks and drinks. Live Mexican music on weekends. La Verbena Terrace (The Street Party) - Seasonal bar serving snacks and drinks. Rollaway/extra beds are available for MXN 250.0 per night. This property offers transfers from the airport (surcharges may apply). Guests must contact the property with arrival details before travel, using the contact information on the booking confirmation. Reservations are required for massage services. Reservations can be made by contacting the hotel prior to arrival, using the contact information on the booking confirmation. No pets and no service animals are allowed at this property. Parking height restrictions apply.